Pushups are one of the first exercises everyone learns, you can do them at any age because they are easy to do. 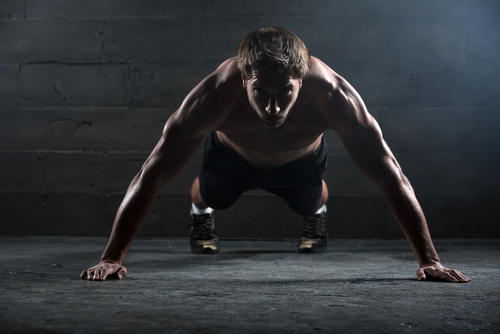 Pushups were great tools when we were kids growing up, but if you’ve been at all serious about weight training as you’ve aged, the traditional pushup becomes way too easy. As you progress doing pushups you keep adding more and more reps, but you eventually hit a point where the returns you get from doing the exercise aren’t worth the time and effort. This is why many people just view pushups as a good warm up exercise, and not a good tool when it comes to putting on mass. The problem with doing pushups is the same with any other exercise, after time your body gets really good at doing the same movement over and over again. Your body becomes more efficient in performing the movements, requires less energy in doing so, thus giving you less results. No one wants to do an exercise for 100 reps at a time which is very possible if you become good enough at doing pushups. Most people don’t want to spend the time doing this many because again, the benefit isn’t worth it. 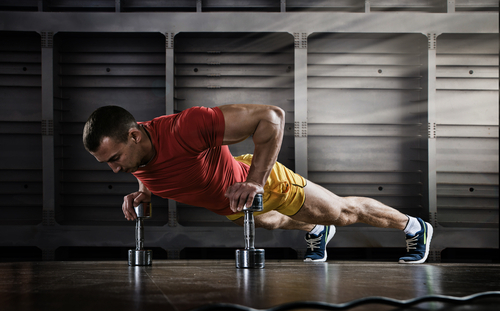 Most people just forget about doing pushups altogether, but you can make your workouts much more effective by making simple modifications to your pushup exercise. Remember when it comes to building muscle it doesn’t matter if you’re using bodyweight or free weights, the resistance on the muscle is still the same. Elevated pushups are a great variation on the traditional pushup because elevating your legs on a chair or bench will put more weight on your arms and chest, making the pushup more difficult. Another great aspect of this exercise is that it is very easy to modify, as the higher you elevate your feet, the more difficult the exercise is. Elevated pushups are also beneficial in that they promote good shoulder health because they activate the serratus anterior, or the muscles slightly below the shoulder blades. When it comes to shoulder health, most people especially those that workout tend to neglect the rear deltoids more so then the front, causing rolled shoulders. Elevated pushups are a great exercise to use to try and correct this bad posture. If you have never done these pushups before, a good starting point is about 6 inches to a foot off the ground. If you get good enough you can get to the point where these become too easy and can strat trying handstands instead. Pushups are one of those exercises where we usually don’t think outside of the box and thus are limited to one range of motion. There is only so far you can pushup, and when you lower yourself you have the floor in your way, so there isn’t much room for variation right? Traditionally we do pushups with our palms flat on the floor but you can try them close fisted to get more space between you and the floor which is going to give you more range of motion on your way down. Doing pushups on your fingertips is another way to increase your range of motion by elevating yourself further from the floor, and on top of that they engage more of your forearm and hand muscles to make your pushups more difficult. This is probably the simplest way to really put on more size by ramping up your pushups. This is the thing that first comes to most people’s minds when it comes to different pushup variations, but the problem is that this isn’t exactly easy to pull off. Getting to the point where you can do only one armed pushups is difficult, and why most people give up if they’re transitioning straight from traditional pushups to one armed pushups. You want to gradually work yourself up to that point, starting from there usually leads to failure. First try removing another point of contact to work your way up to using one arm, like only using one leg and slightly raising the unused leg off the ground while performing the pushup. There will be a point where you get used to these exercises as well if you keep at it long enough, so throw in some more variation from time to time. Try combining some of these techniques together or try making up some on your own to switch things up.